At their best, these kinds of responses are polite. The proposed scenario may inconvenience my partner. I should ask him or her before I proceed. However, at their worst, these excuses are disingenuous and disempowering. Rather than demonstrating your capacity to answer a question straightforwardly, you abandon responsibility and make your partner a pawn. This practice is especially detrimental in the workplace. Whether they mean to or not, women who reply in this way send a signal that they are not as interested in or committed to career advancement. By comparison, men almost never respond in this fashion. When considered for promotion, men leave the excuses at the office door. Women bring them in. But why? 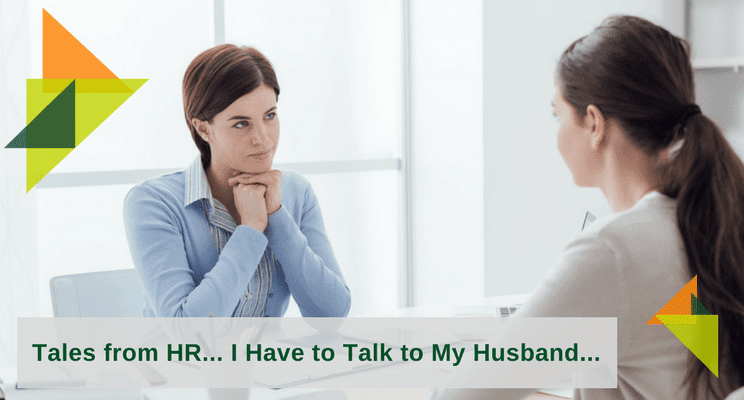 It is important to understand that “I have to ask my husband” can have several interpretations. Taken literally, it makes a woman seem powerless. As though she is not in control of her own career trajectory. It is understandable that Human Resources recruiters could develop biases after repeatedly hearing women answer in this way. If she really wanted this promotion, she would say so, instead of using her partner as an excuse. However, “I have to ask my husband” should not be viewed as a deal breaker. Despite how it sounds, the phrase is not necessarily a sign that a woman is disinterested or any less worthy of a promotion than a man. Women have their own unconscious biases at work here. Many women consider themselves caretakers in their homes. “I have to ask my husband” might simply mean, “I want to think about how this promotion—which may require more responsibility, longer hours, or more travel—will impact my family. I need some time to develop a plan.” It is likely that men think about these same things when offered promotions, but their own unconscious biases discourage verbalizing such self-revelation. Instead, men are conditioned to speak more definitively – “Yes, I will take the job” – whether they believe themselves capable or not. In these situations, transparency and training can help everyone unpack the language of unintentional gender bias in the workplace. Train the women and men in your workplace about the impact of bias on negotiation and promotion. Train those in Human Resources to recognize that men and women may respond to offers of career advancement in unintentionally gendered language. Remind those in positions of management that men and women may be equally qualified for a promotion, but are socially conditioned to respond to praise and leadership very differently. Work to implement gender-neutral practices. You might encourage all employees, for example, regardless of gender, to take at least twenty-four hours to consider offers of promotion with their families. Ready to advance high-potential women into senior leadership?